Click on the links below to view past copies of Let's Go Soul Winning or complete the form to receive a copy of Let's Go Soul Winning emailed to you every Wednesday. 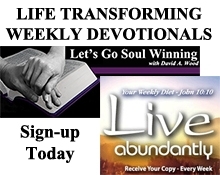 Also receive a copy of Live Abundantly emailed every Monday. Let's Go Soul Winning - Winning the "Up-and-Outer"
Let's Go Soul Winning - "Prospects by Referral"
Let's Go Soul Winning - "Qualifying the Prospect"
Let's Go Soul Winning - Always Remember "Hell"
Let's Go Soul Winning - What Will "Keep Me Going"? Let's Go Soul Winning - Where Do I Get Confidence to Begin Witnessing? Let's Go Soul Winning - Always Introduce "Jesus"
Let's Go Soul Winning - Always Remember the "ONE"
Let's Go Soul Winning - The Value of the "Second Man"
Let's Go Soul Winning - Presenting the Gospel Will Not "Run Him Off"
Let's Go Soul Winning - What To Do When A Prospect Says "No"
Let's Go Soul Winning - Is There "Fear" in Soul Winning? Let's Go Soul Winning - Always remember the "Field"
Let's Go Soul Winning - Always Set a Definite Time "To Go"
Let's Go Soul Winning - Always Be "Folksy"
Let's Go Soul Winning - Did I Win the Next D. L. Moody? Let's Go Soul Winning - Always Eliminate "Works"
Let's Go Soul Winning - Always "Cast the Net Right"